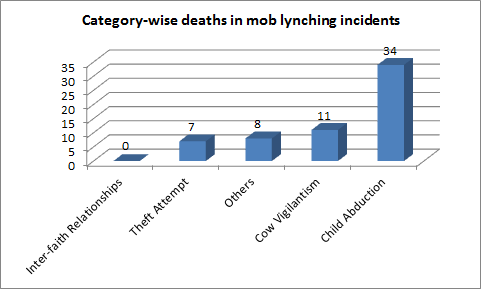 Feb 07, The year 2018 saw 84 incidents of mob lynching. According to Centre for Study of Society and Secularism (CSSS) findings, 60 lives were lost and 102 persons were injured in 84 incidents of mob lynching reported in five newspapers. For mob lynching too like incidents of communal violence, CSSS monitored Mumbai editions of five newspapers namely, “The Indian Express”, “The Times of India”, “The Hindu”, “Safahat” and “Inquilab”. In the latest video from Meerut in UP, it could be seen that police officials assaulting a Hindu woman in a police vehicle. The woman was ‘rescued’ by the police was found with a Muslim man. The VHP had assaulted the man and woman for their alleged relationship. “You prefer Muslims when there are so many Hindus around,” taunts a police woman. This indicates the extent of patronage the Hindutva outfits enjoy and also the complicity of the police which is seen endorsing and promoting political propaganda. Another video which went viral was from Pakistan where the abduction was staged to create awareness about abduction. But these videos and subsequently similar videos alleging kidnappers of the children harvest the organs of the innocent children led to 34 persons being killed. 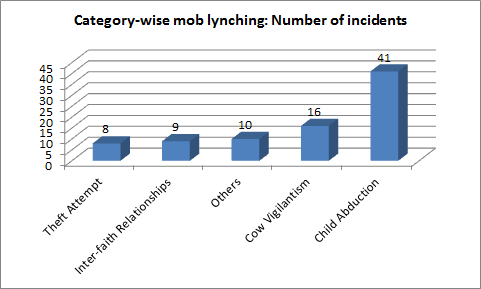 Interestingly, 41 mob lynching incidents are attributed to rumours related to abduction of children. Most of the incidents of mob lynching — 70 have taken place in states ruled by BJP followed by states ruled by AIADMK which is primarily Tamil Nadu at 5, Congress ruled states (5), 2 incidents in West Bengal ruled by Trinamool Congress, one incident in Andhra Pradesh ruled by TRS and lastly one incident in Telangana ruled by TDP. Highest number of mob lynching cases in BJP ruled states indicate towards how the ruling party has allowed violence and lawlessness to operate rampantly. The incidents of mob lynching targeted the marginalized communities. 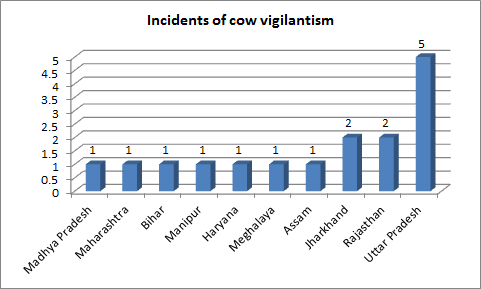 Mostly the Muslims were targeted in the mob lynching related to cow vigilantism. 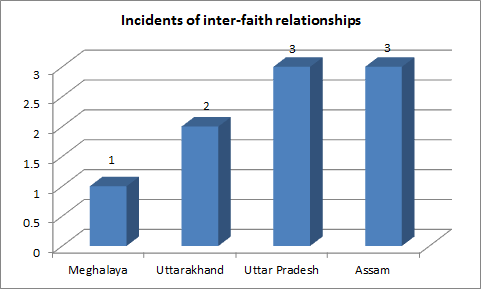 Muslim men and Hindu women were targeted in the violence related to interfaith marriages. Women were also victimized as the figures indicate — five (5) women died and eleven (11) were injured.